It is often difficult to focus on two different exam preparation together. But candidates who want to try their luck at multiple government jobs, need to do it anyway. Currently, SBI PO exam and LIC AAO are two major recruitments that are going to take place in the coming few months. The SBI PO Prelims exam will be held from 8th June onwards and LIC AAO Prelims will take place on 4th and 5th May. As you can see that both the exams are going to take place almost back to back. So how can candidates manage to prepare for two exams simultaneously without any problem? Keep reading to know how. As you can see that luckily, both these exams have similar exam pattern and weightage of marks. The only difference between the two exams is the time distribution. 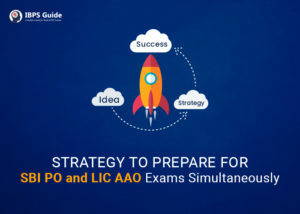 While SBI PO Prelims exam allows you to attempt any question in any section within 60 minutes, LIC AAO will give you strictly 20 minutes per section, which means you need to finish all the questions from a particular section within a stipulated time and you can’t go back once the sectional time is up. English Language section for both the exam carries a weightage of 30 marks while the other two sections, Quantitative Aptitude, and Reasoning Ability carry 35 marks each. SBI PO vs. LIC AAO: Which is better and why? You are free to make changes in the study pattern as per your convenience but whatever you do, spare a complete day for practicing mock tests. Also, while preparing for category 1 and Category 2, try to solve 2-3 mock tests in between from all the 3 categories. As you can see that, you have almost a month left for SBI PO Prelims exam and 2 months for LIC AAO exam, utilize this opportunity to get your preparation strategy in place and get ready for both the exams simultaneously. If you are a working aspirant, you can also check the hacks to prepare for government exams along with a job here. Hopefully, this article will be helpful to thousands of candidates out there who are struggling to balance the preparation for more than one exam. Try out our strategy mentioned and let us know if it worked for you!